Farewell for now bloggy friends! I might be back someday. For now I am focusing on my photography and I am active on instagram. Would love to see you on there! 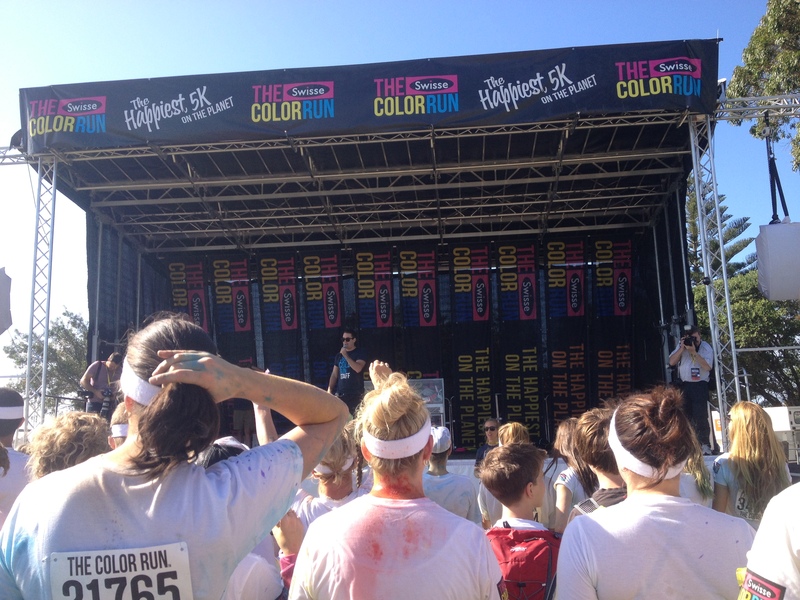 I have wanted to do a color run for so so long! 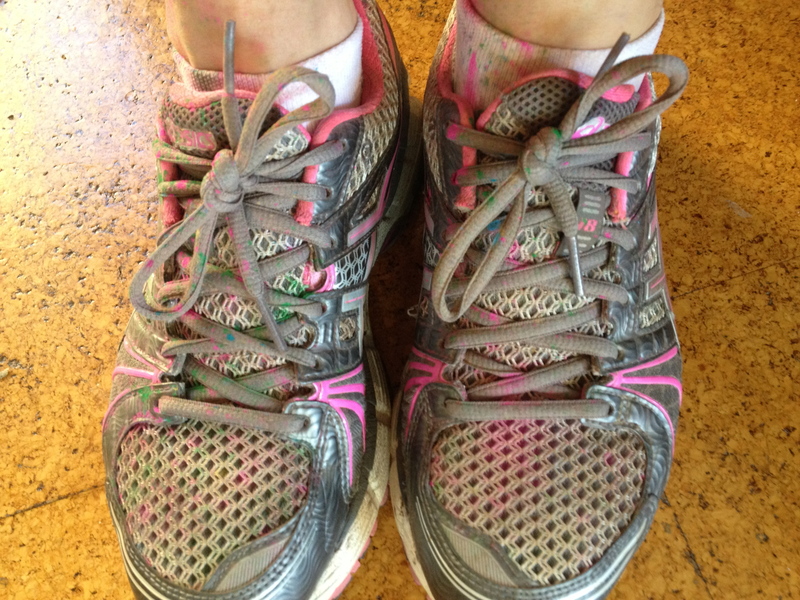 If you have never heard of it, the race is a fun 5k that you start by wearing white and then run through a different colour of chalk paint at each km! I should mention that it originated in the US, hence the color vs the correct spelling colour (I know you were worried for a sec there!). 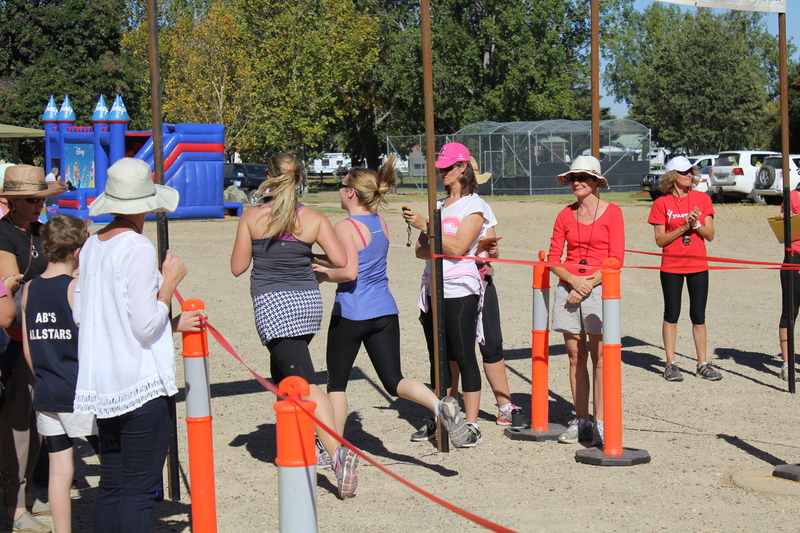 The race had tons of entries and was very well organized. 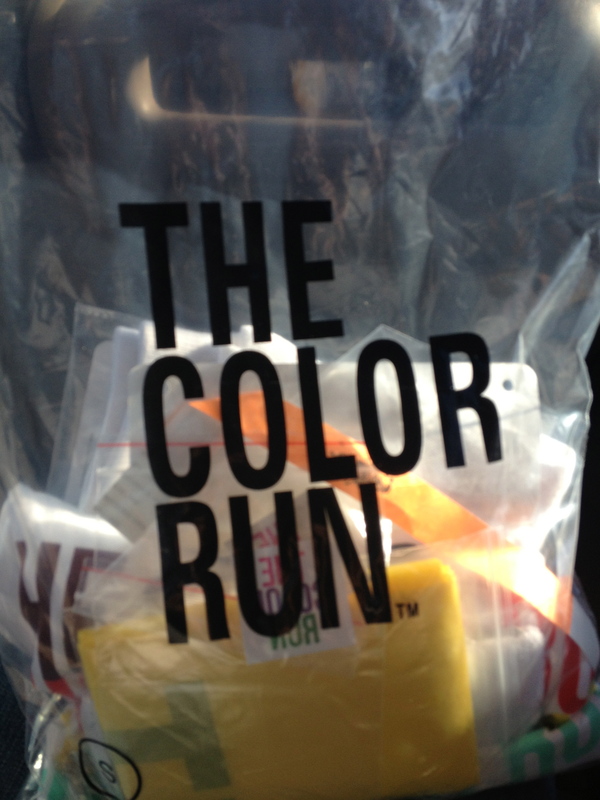 I picked up my race pack the afternoon before. 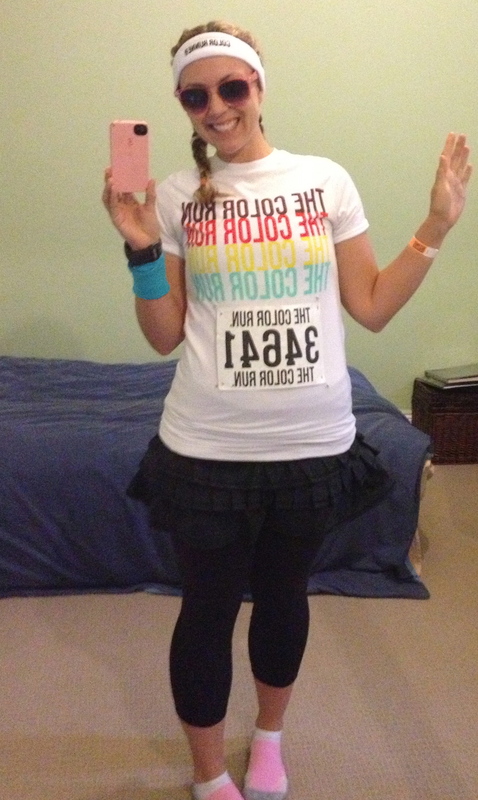 I got a white t-shirt and headband, my number and tattoos and stickers and….. a rain poncho? (ya not quite sure about that one). 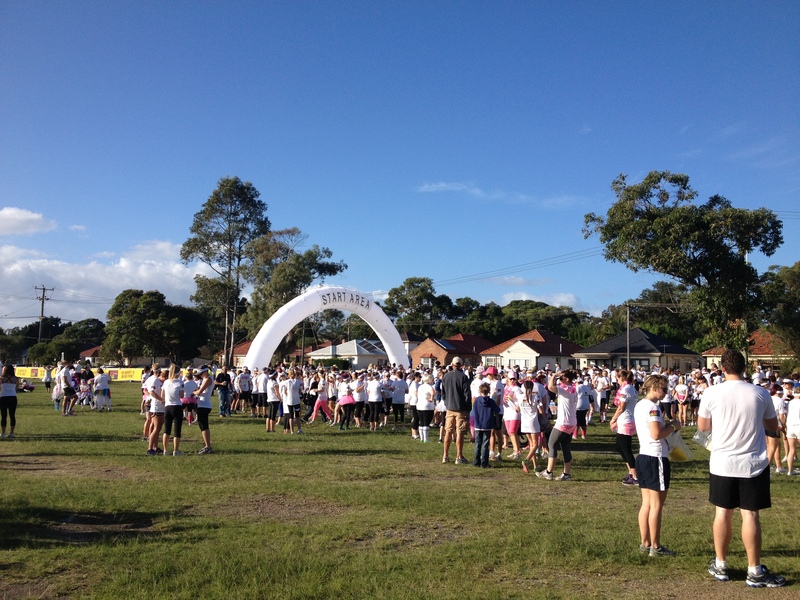 One of the stations, each one is lined with volunteers ready to spray you with colour! Post-run. 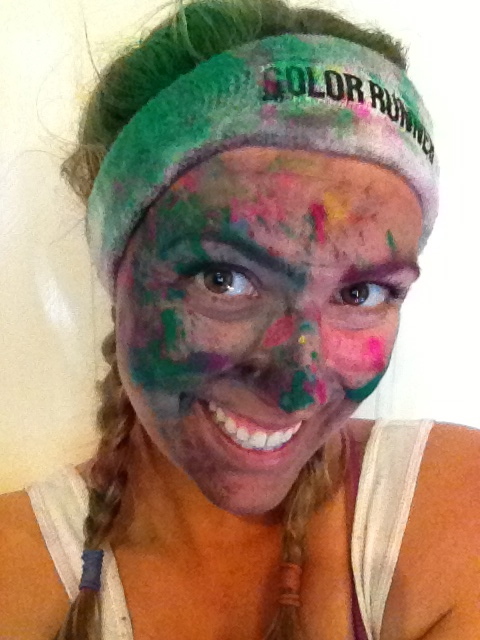 I wasn’t that colourful yet. I also won a wristlet that fit my iphone in it! The best part of the whole thing is the post-race dance party. 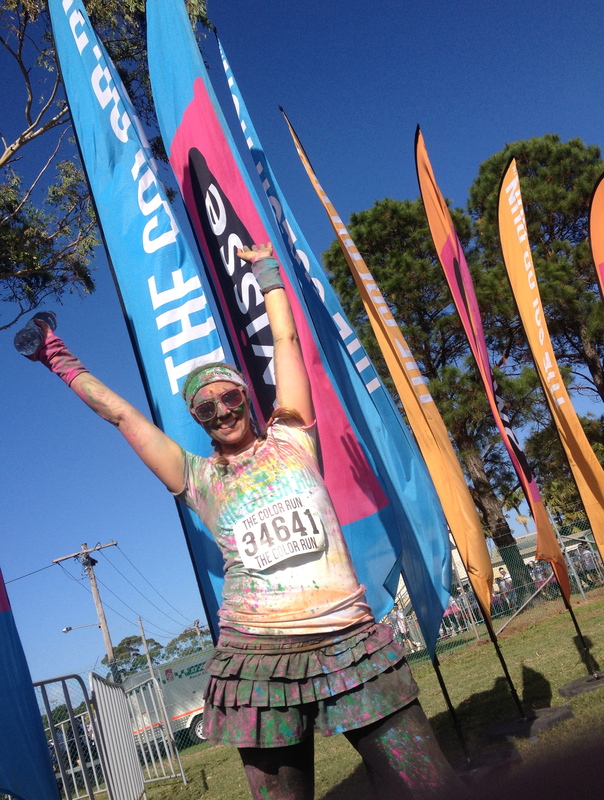 They hand out packets of coloured powder and everyone throws them in the air and then you really get coated!! It was a fun day but not a race really. If I did it again I would go with a big group and take lots of pics and walk. 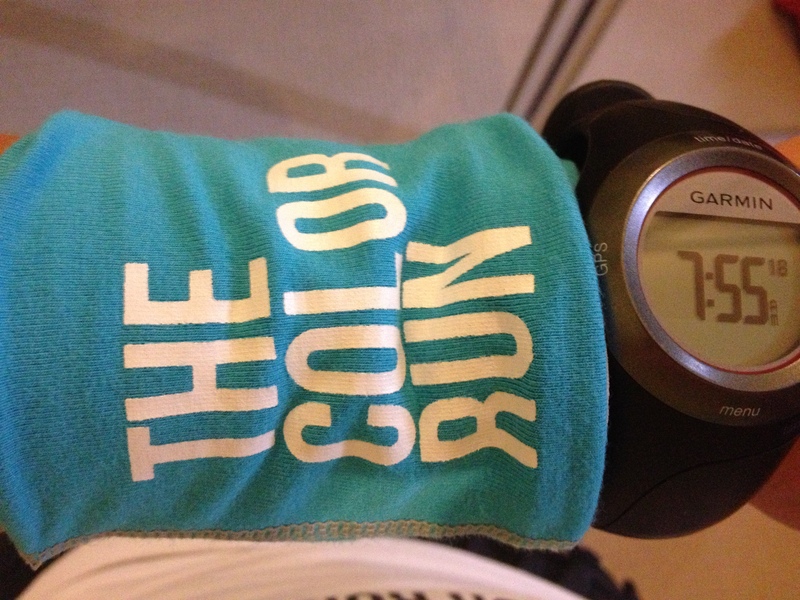 I did run, but very slowly! 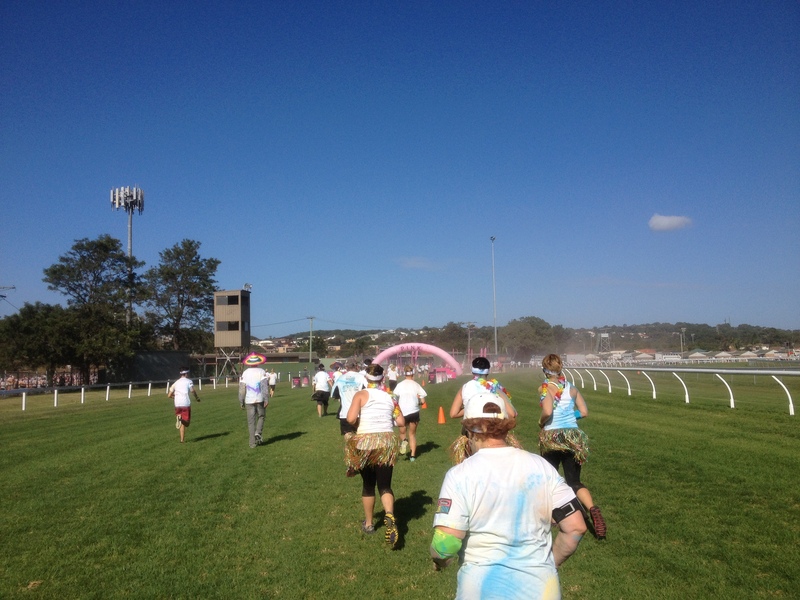 It was so hard to dodge most of the people walking and 3km of the 5km route was on a turf racecourse with really deep grass and it was impossible to go fast. It was like running on a giant sponge! My final time was 27:46. 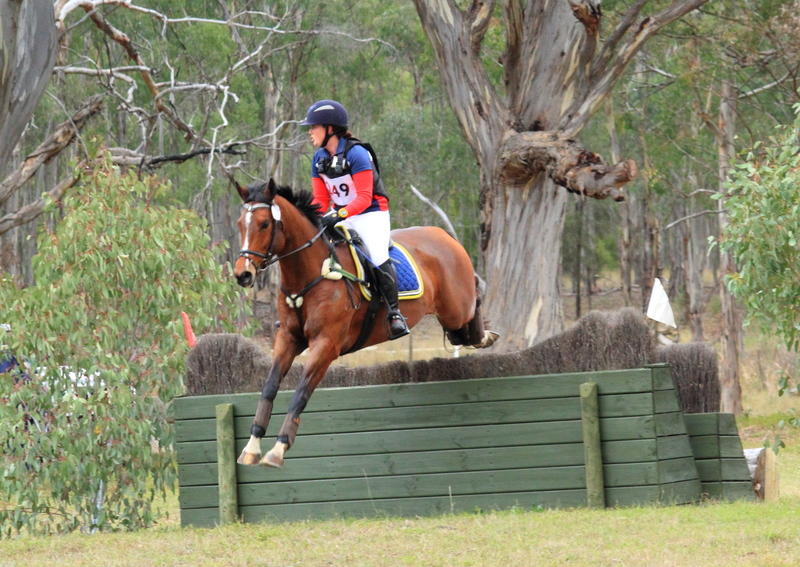 If you are looking for a fun day out this is the race for you! The photo ops were endless. 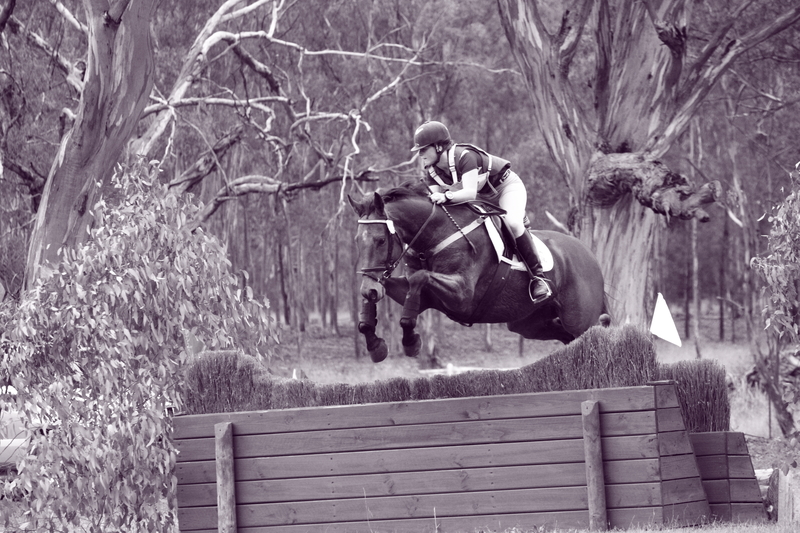 This was the best kind of horse filled weekend! 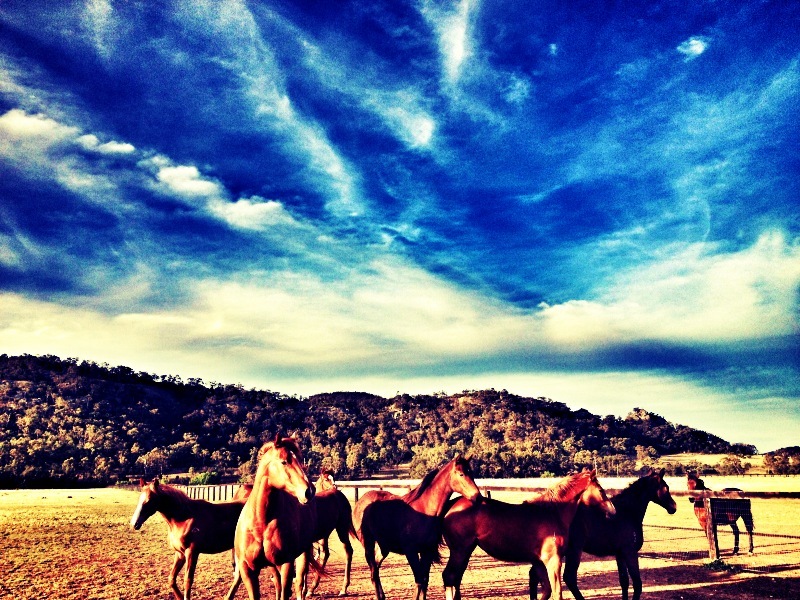 The kind where I am not on call and I actually choose to hang out with horses. 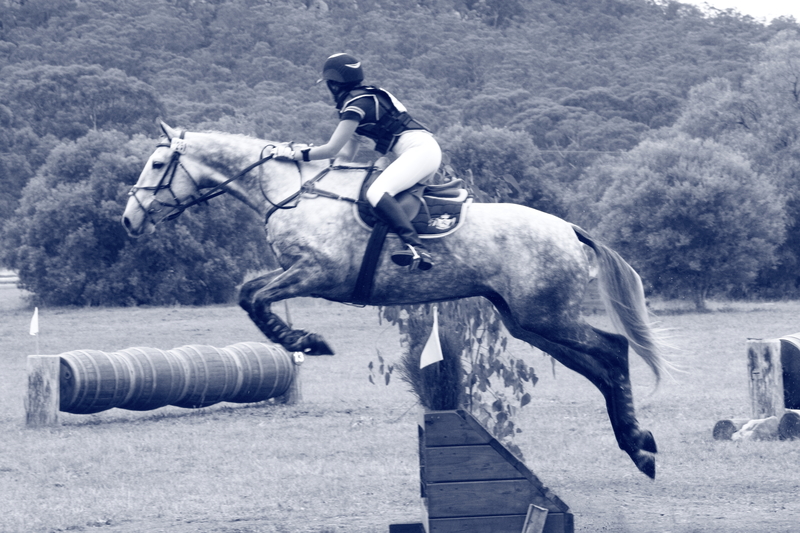 Then on Sunday the local horse trials were on and I went to watch some very gorgeous horses eventing. Thought I would share some of the pics with you. 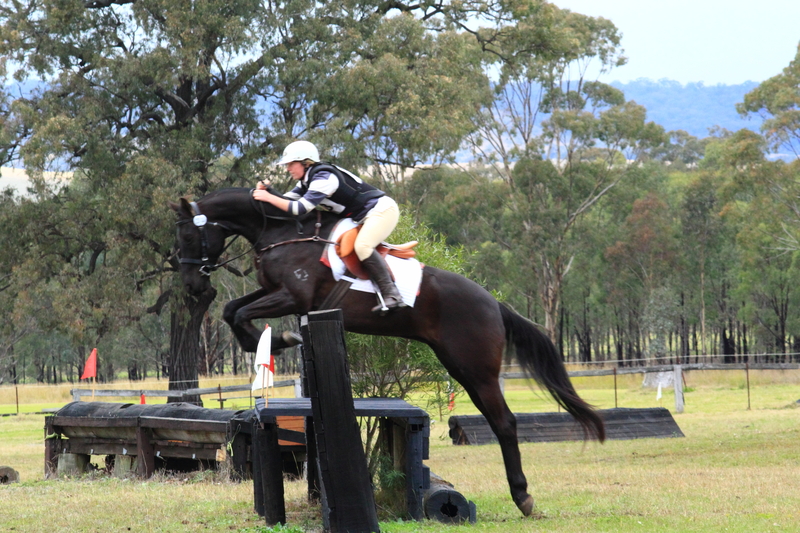 I was so jealous, I wanted to pull someone off their horse and have a go…..the jumps looked awesome! So who wants to buy me a lovely jumper? Anyone? Well this post has been a long time coming! 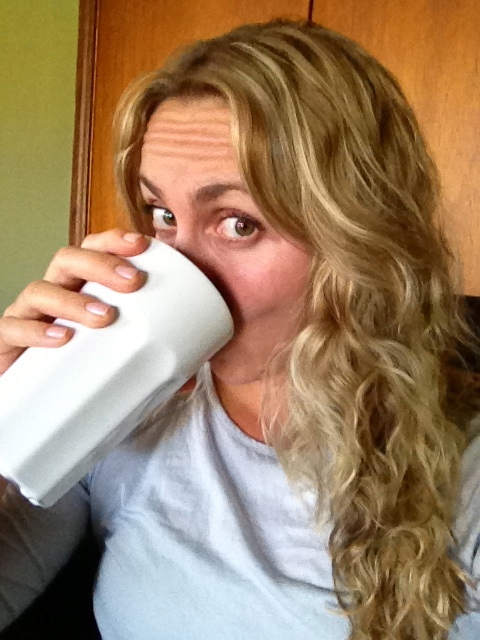 I have been a blogging slacker…hey it happens! Luckily I haven’t been a running slacker which is my usual area of neglect when I get busy. 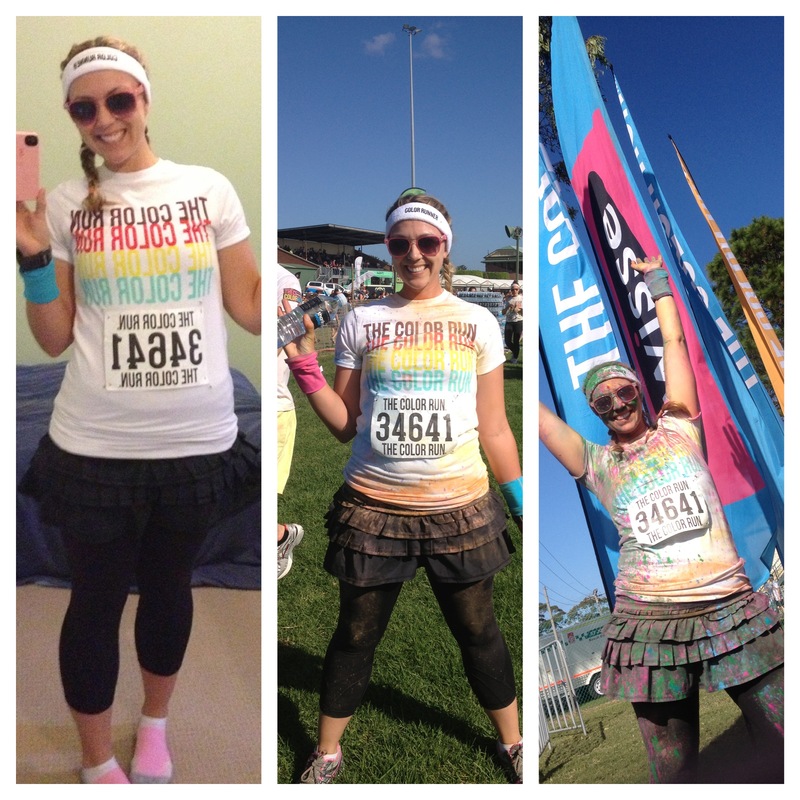 Ok a while back I was training for a 10k for the start of racing season 2013. 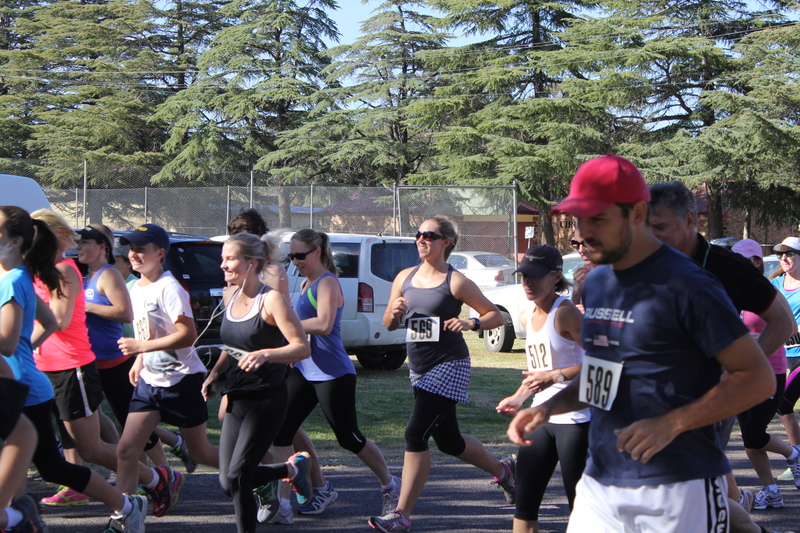 Unfortunately an injury got in the way and I was only able to run the 5k race. 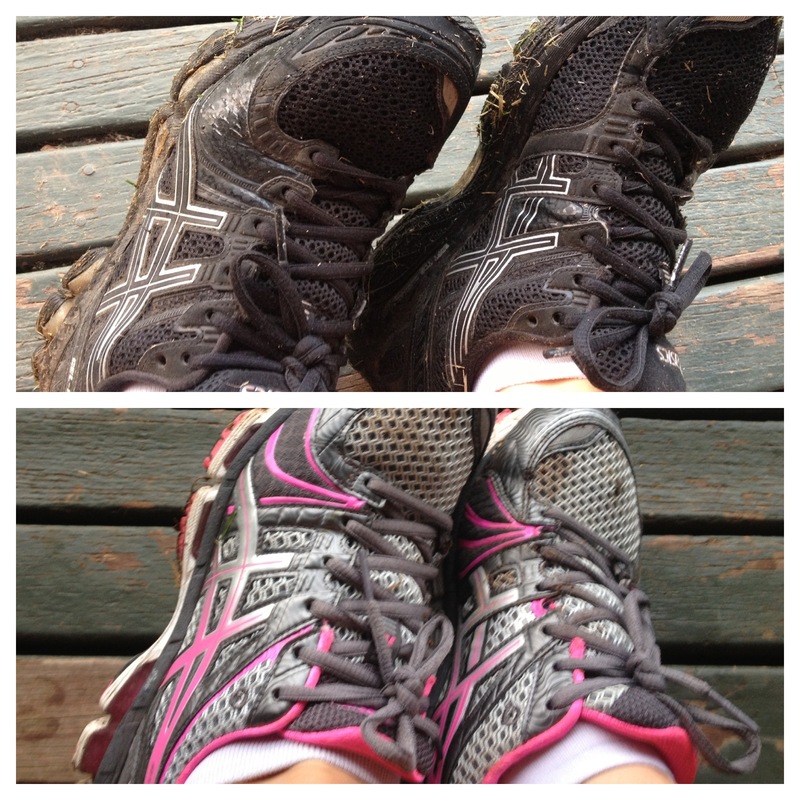 I was doing a 10k training run and at about 7k in I had a sharp shooting pain from my foot up to the top of thigh. I had to stop and Al had to come and pick me up from the side of the road 😦 I saw my massage therapist and he told me it might be plantar fascitis and not to run….so obviously I totally ignored that advice and kept running anyway….fool! 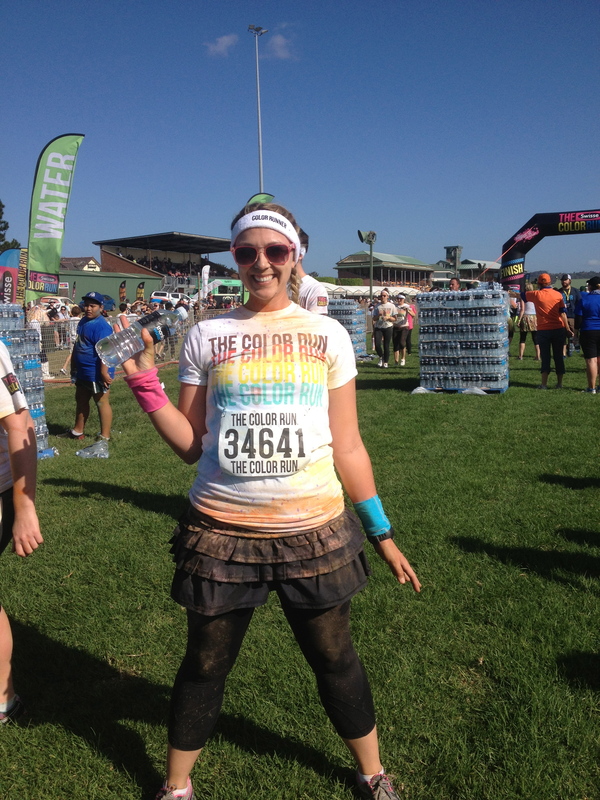 I did some short runs and lots of stretching and I felt ok for the race. 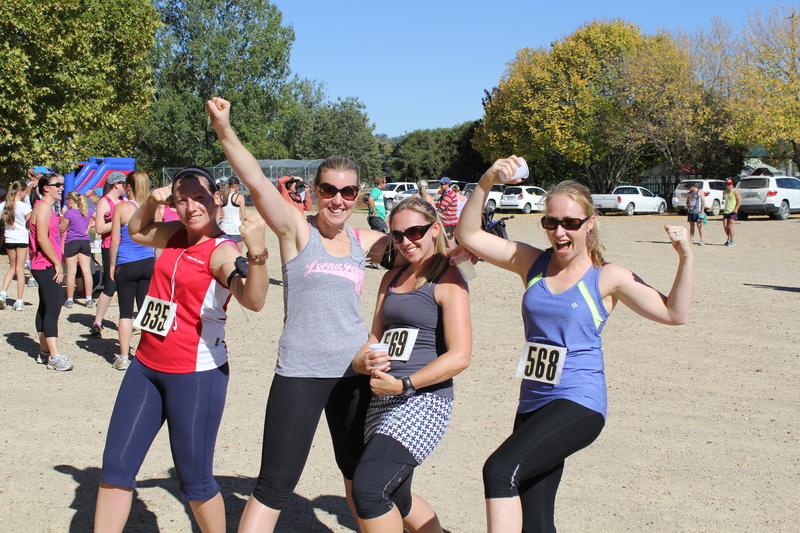 We had some friends come and join us for the weekend and Bern wanted to do the run, much to my delight, so we ran together! It was a fun local race but a bit of a drive away so we got up at the crack of dawn, green monter smoothies in hand and hit the road. It was a really hot day and the race didn’t start until 10:30 and the sun was really beating down. I was grateful we picked the 5k. 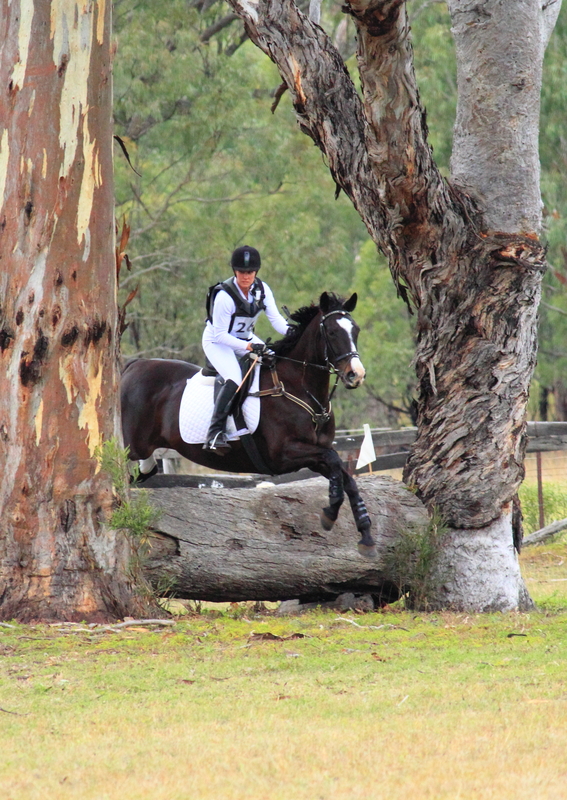 It was a very flat course and looped out of the town, along some lovely country roads. We came over a hill and could hear the crowd (very small one) in the distance and finished strong. I’m glad Bern was there to hurry me up at the end because I was hot and not really in the mood to sprint! But I did anyway! 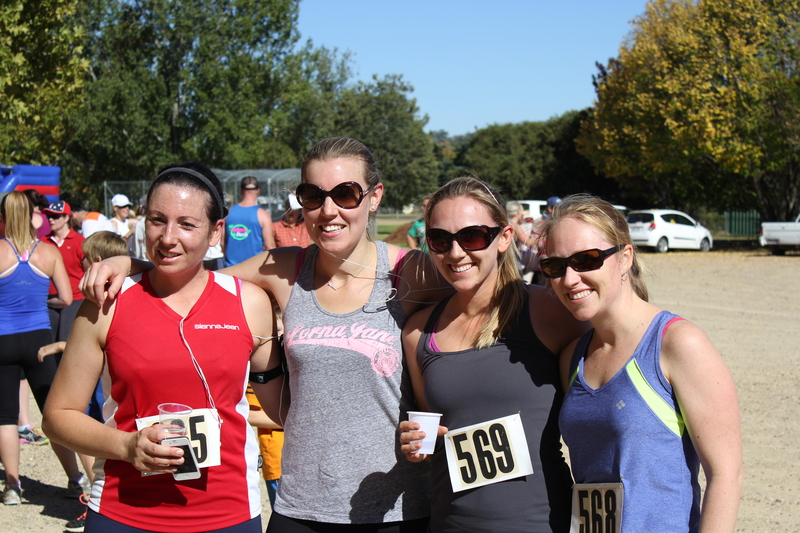 Group finish shot with my vetty friends April and Candice joining us. 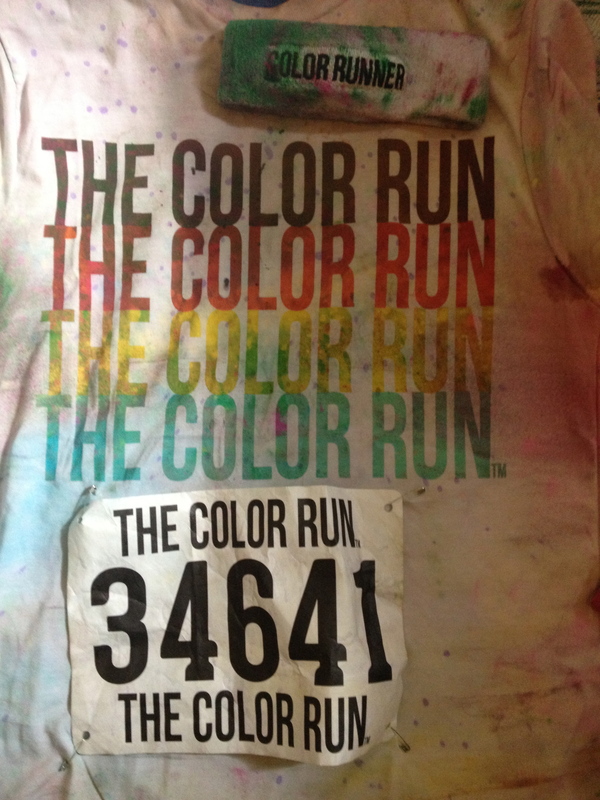 Best part about this race…I got to run with a friend for the first time ever and it was great! 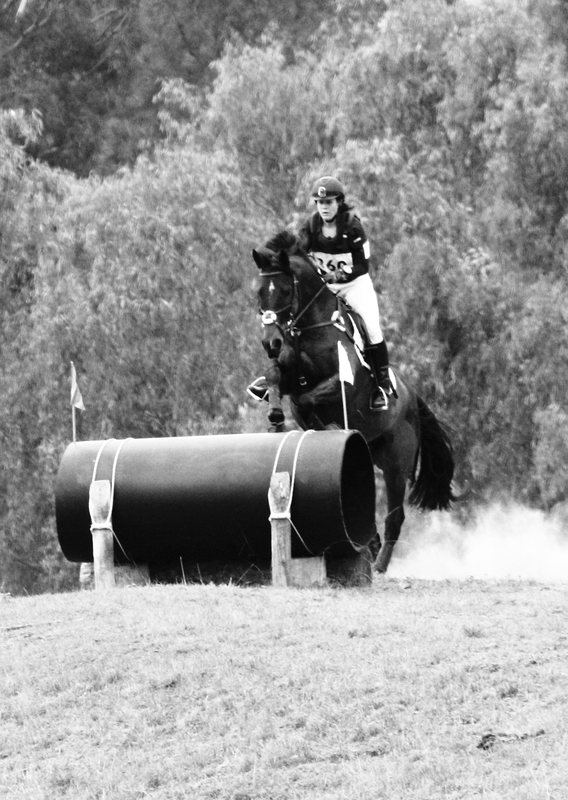 Worst bit…no medals, waaaaaa. 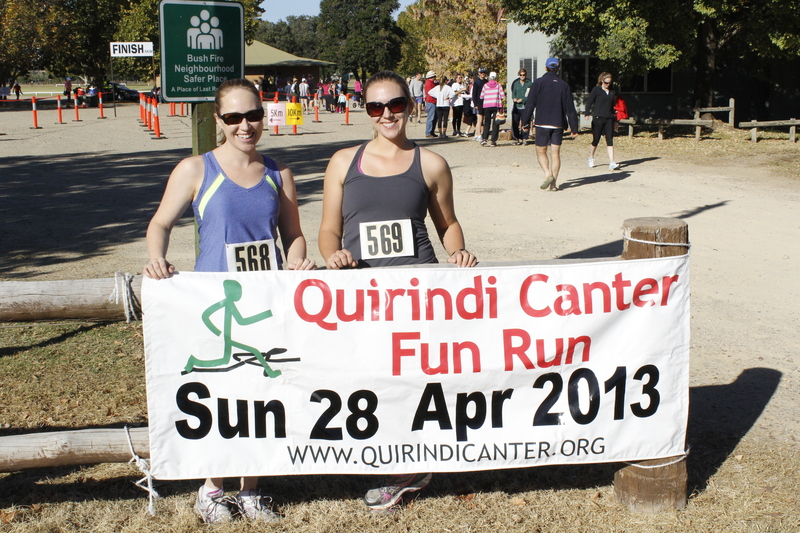 Its only a small town fun run after all. Still a good day and still on the list for next year! Special thanks to our cheering section, Bern’s husband Steve, Al and Salty. 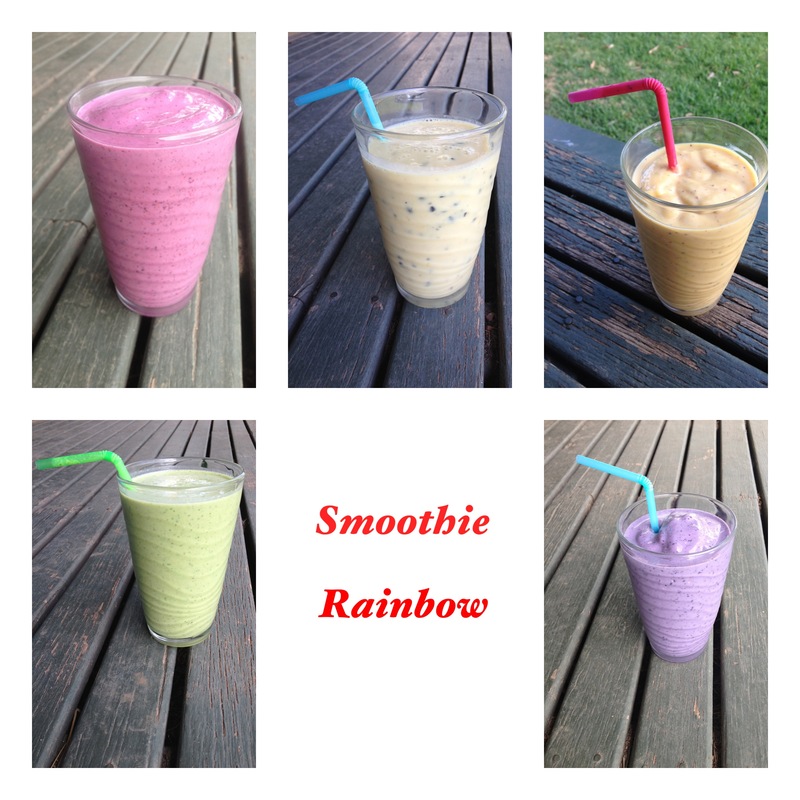 Smoothies are one of my favourite things. They are an incredible way to pack in some essential nutrients, protein, fruits and veggies without you even knowing about it. Hate leafy greens? Don’t know what to do with chia? Need a way to hide some horrible tasting superfood powders? Want to try a dairy-free milk alternative? 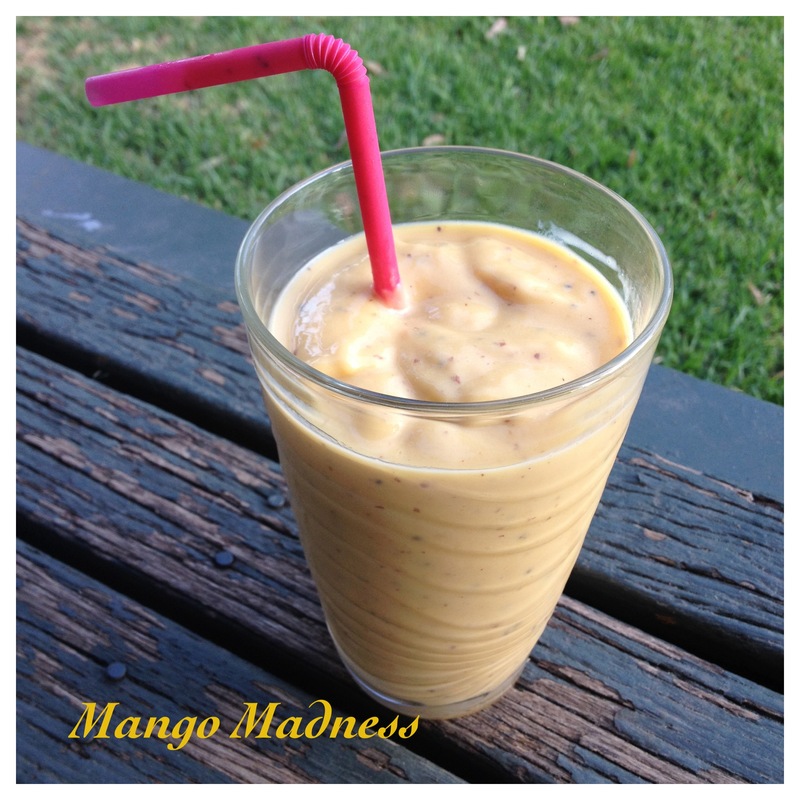 Get a smoothie into your gullet! Theses are the ultimate fast food and they are so delicious. I have a smoothie almost every day. Usually for breakfast. 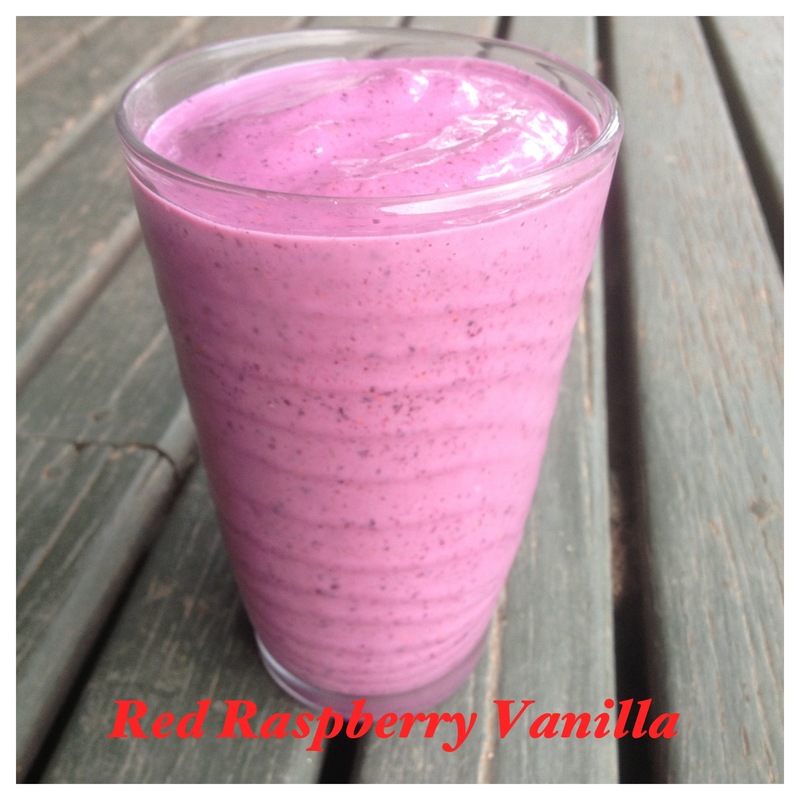 Even in the winter I sit huddled up in a blanket sipping my chilled smoothies….they are just too good! Here are a few of my faves. All of these recipes are adaptable. Adjust the add-ins and be creative! 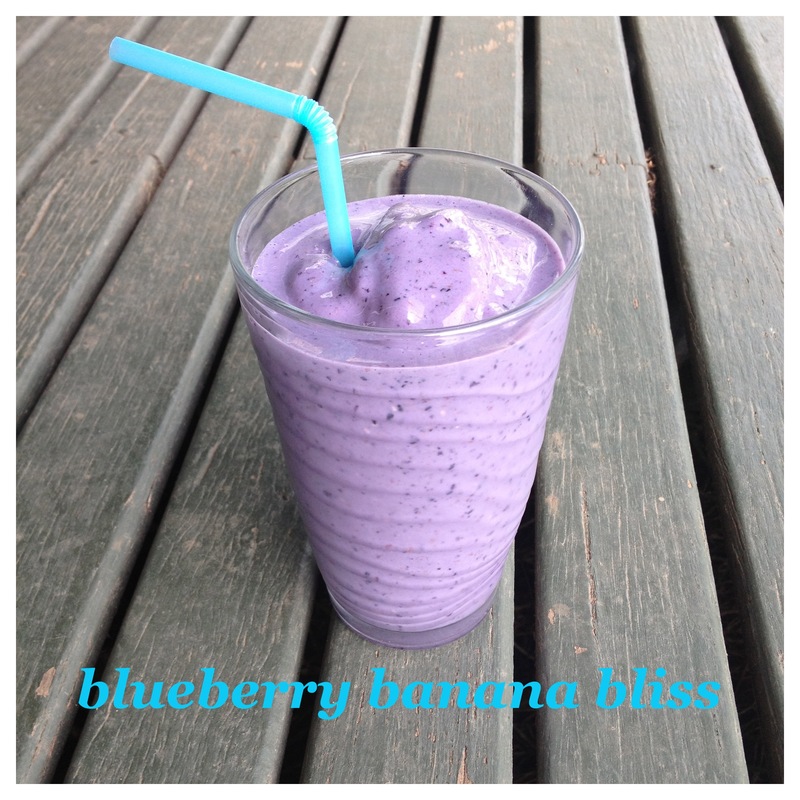 frozen banana– used in most of my smoothies because it makes them, thick and creamy and I don’t have to add any sweetener as the banana does the trick naturally. Frozen is key to a delicious and thick texture. So here comes the rainbow! I learned that ROY G BIV is the rainbow, in kindergarten I think! Red Orange Yellow Green Blue Indigo Violet. Follow the measurements above to make, and most importantly taste, your rainbow! This weekend I felt like I had a really relaxing and lazy sunday. On monday I realized how much I had packed into one day……don’t you just love the weekend?! Nothing feels like work. I drank some green tea…ok I dank a lot of green tea because I was cold. Whole pot to myself? Don’t mind if I do! I cleaned the house and found an unexpected guest. 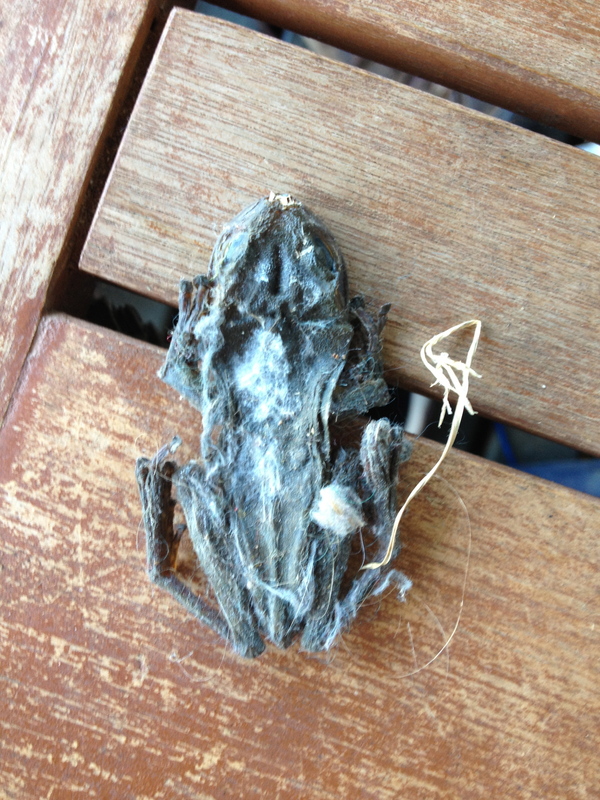 A dried out frog. Yes I screamed…ew. I made a yummy lunch. 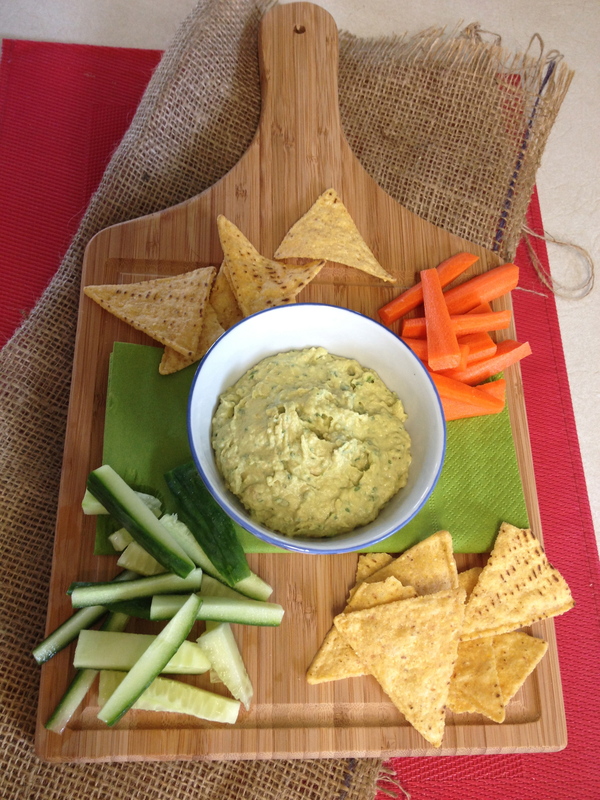 And I tried out avocado hummus for the first time. 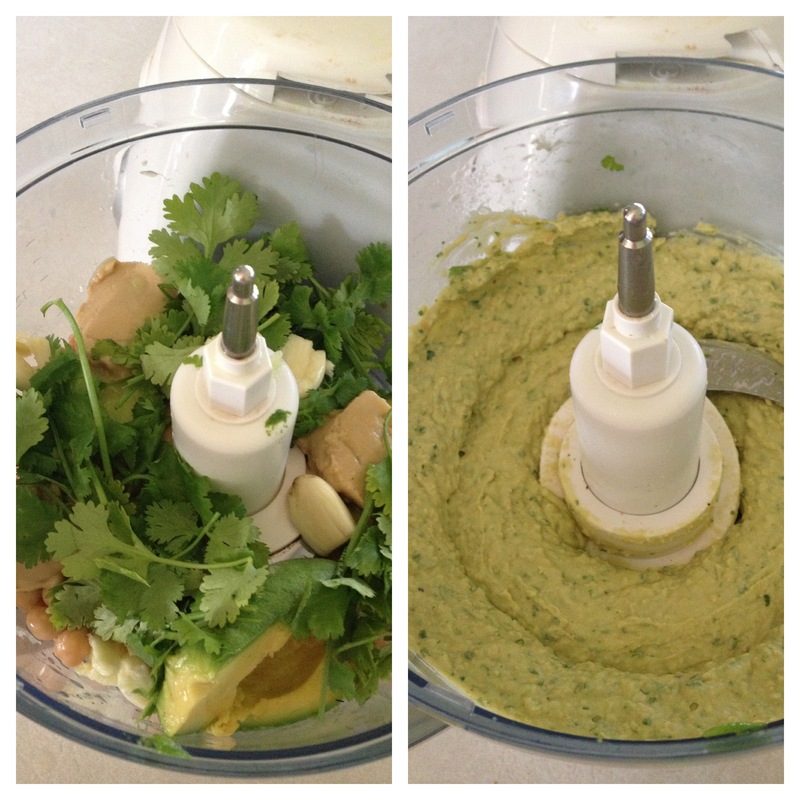 Its a basic hummus recipe with some avocado added and some cilantro and lime. 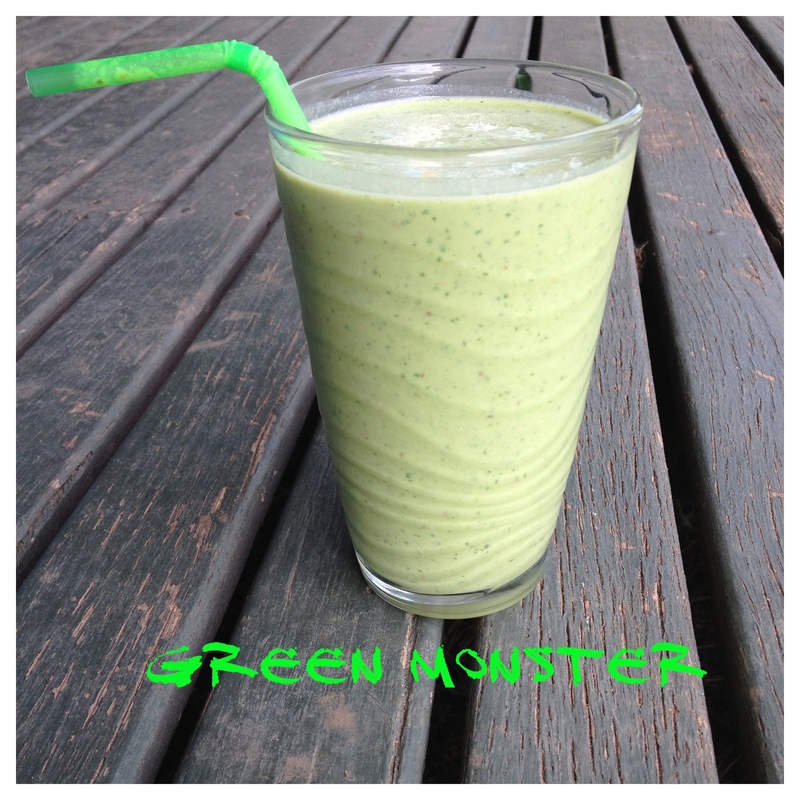 The avocado makes it extra creamy….sooo yum! I tried out a new product. 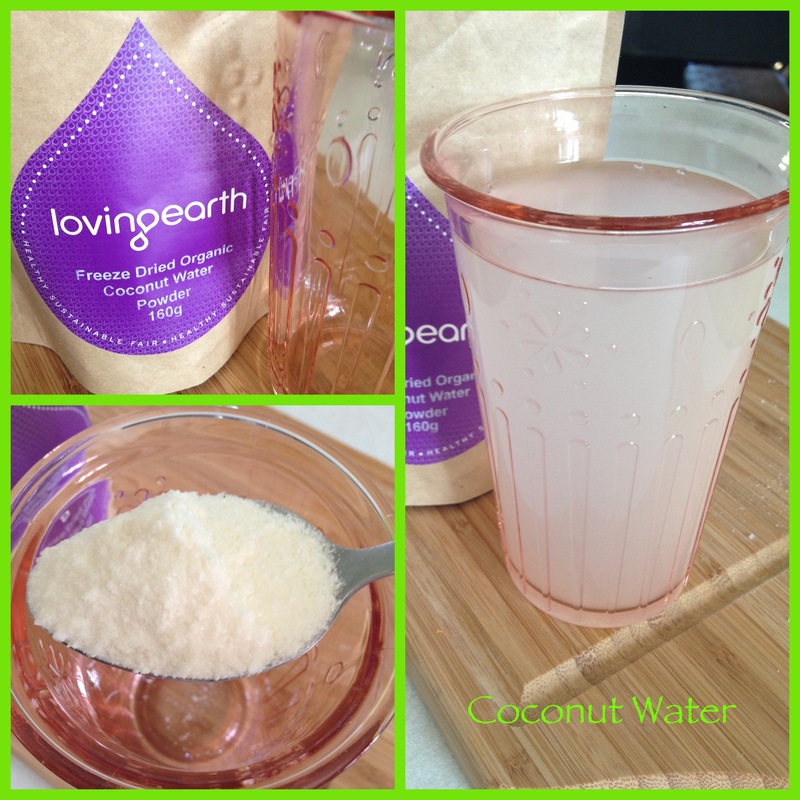 Freeze dried coconut water. I love coconut water, its one of my faves. I ordered this online from a healthfood store and I wasn’t sure what to expect. It dissolves really easily and does not dissapoint. 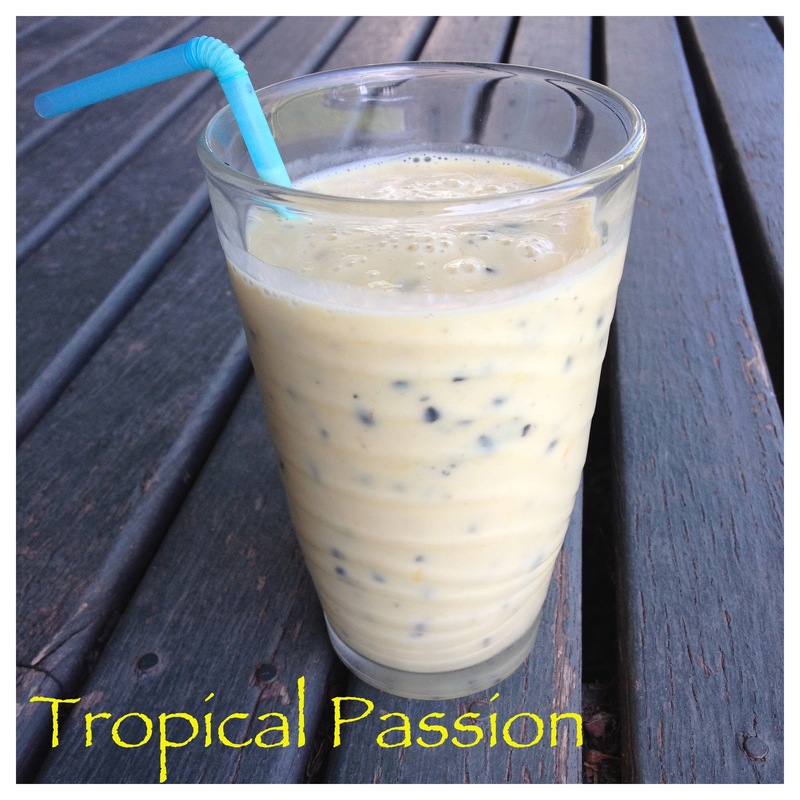 Yummy flavour and very refreshing. 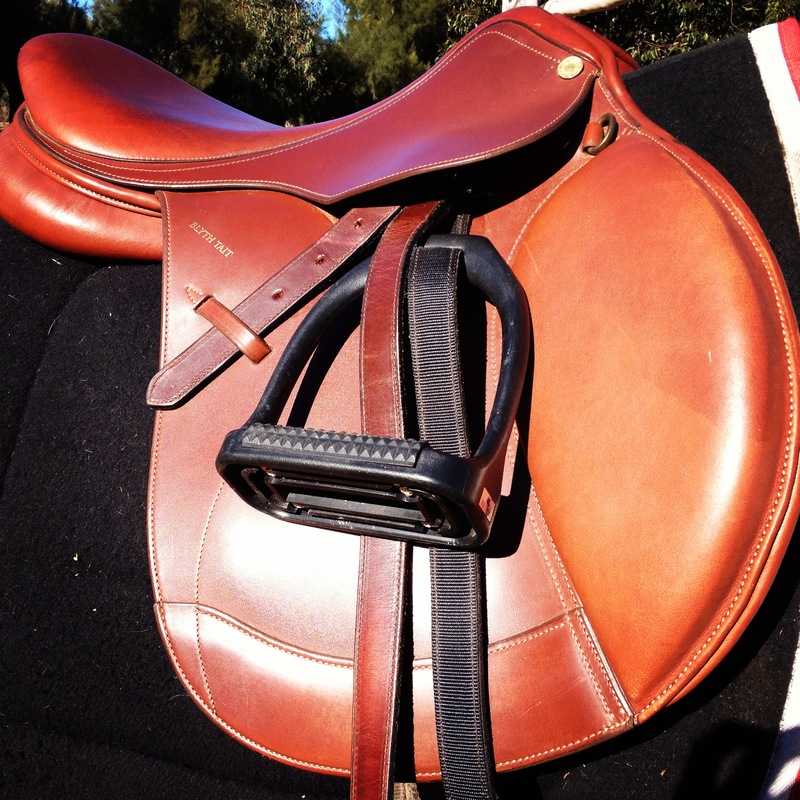 Damn it why must I become addicted to such expensive things….sigh! 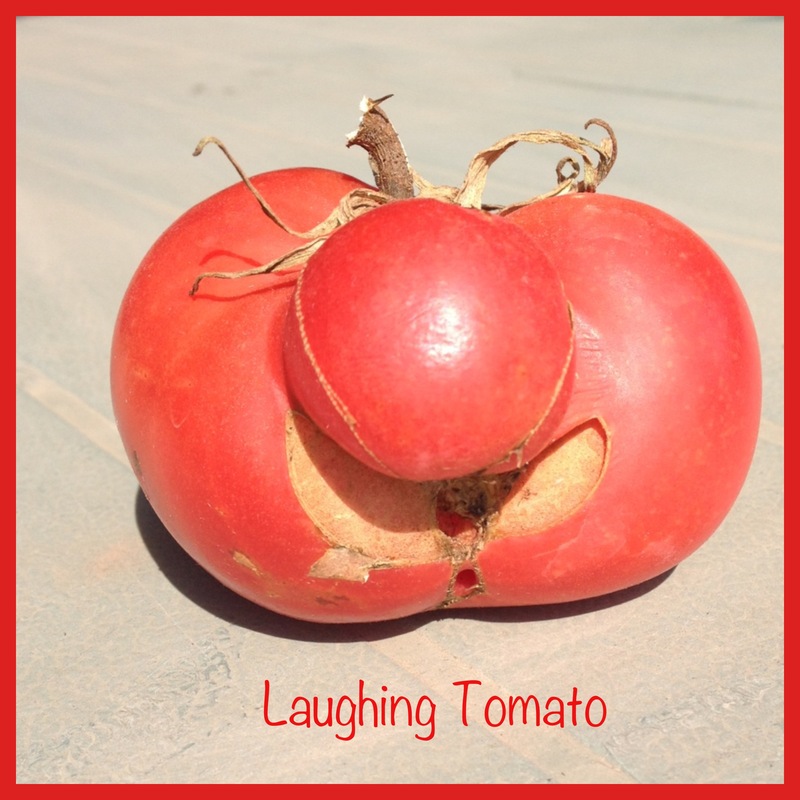 I found a hilarious tomato in the garden. Well he thinks i’m hilarious. 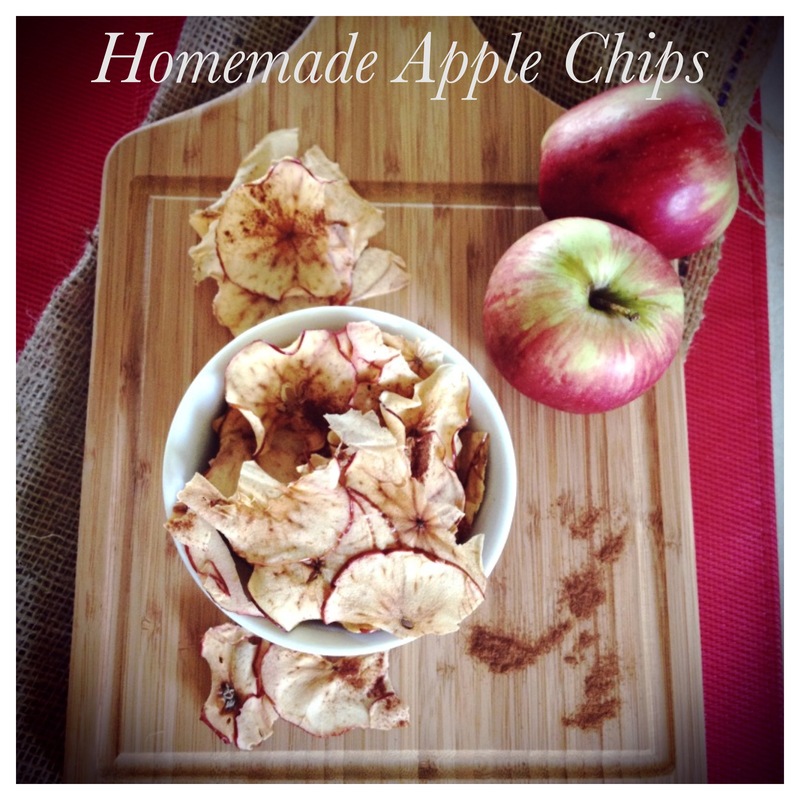 Finally, I made some apple chips. These are soooooooo amazing. 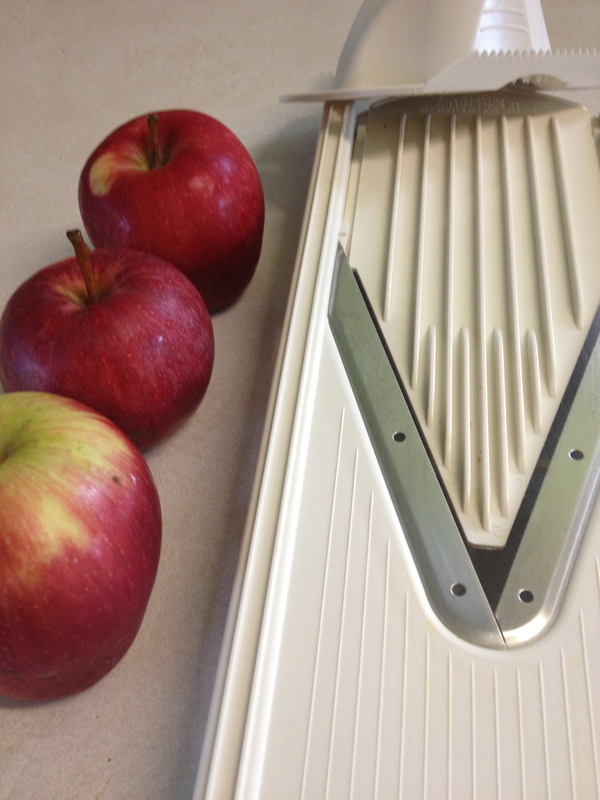 I used a mandolin slicer but you can also use a knife and cut very thin. 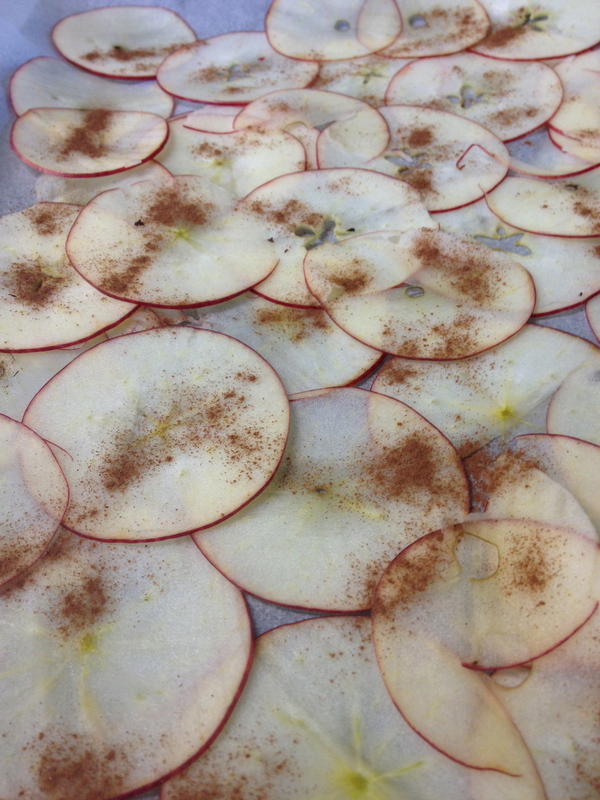 Spread them out on parchment on a baking sheet and bake at 150C (300F) for about 2 hours. 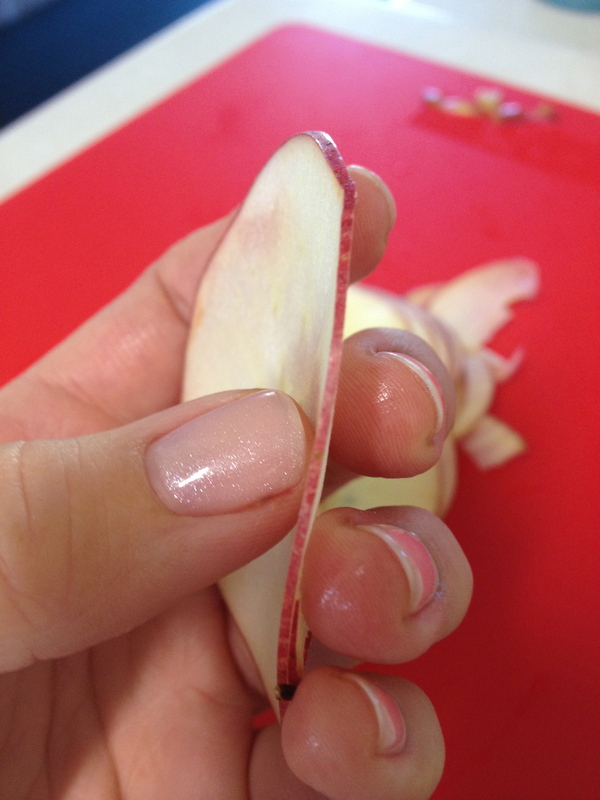 Mine were so thin that I overlapped them a bit and they stuck together…amature move! 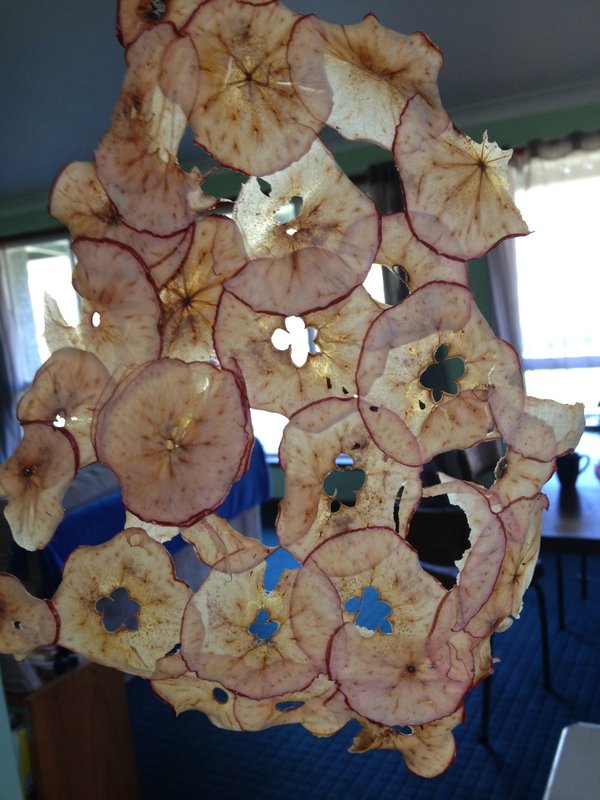 But it did make a beautiful apple stain glass window. I put a sprinkle of cinnamon on one sheet and left the other plain. Do not be tempted to add sugar they do not need it. Super sweet, crispy and satisfying. Yes I ate them all….ok actually I saved some for Al to try and then he had two and I ate the rest. They are just too good. I’d say that is a pretty successful Sunday! 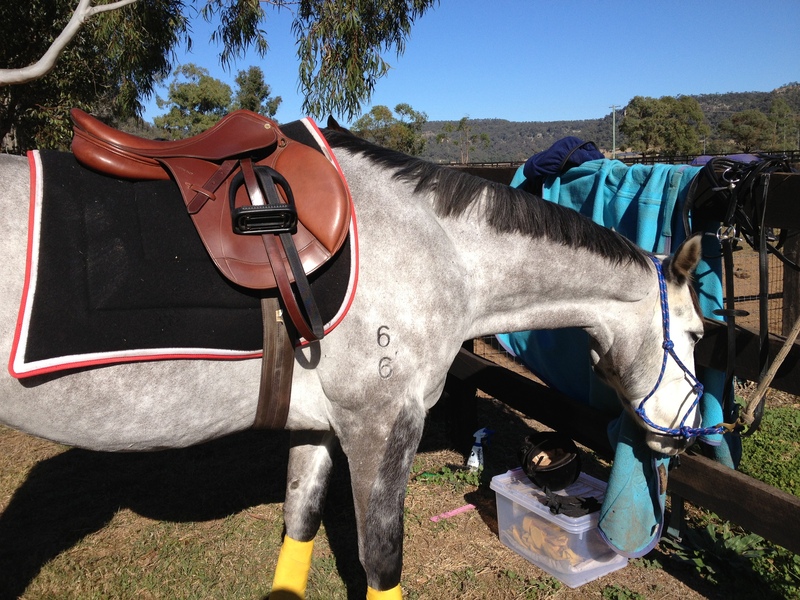 I am going to start posting some photo diaries from my daily life as a vet because I see lots of cool things to share and its an easy and fun way to enjoy them and get an understanding of what a horse vet gets up to. This first diary is very graphic so for you non-vets/people who don’t like blood and guts and such perhaps give it an hour after you eat to view these. You know just like swimming! This is me in my element! 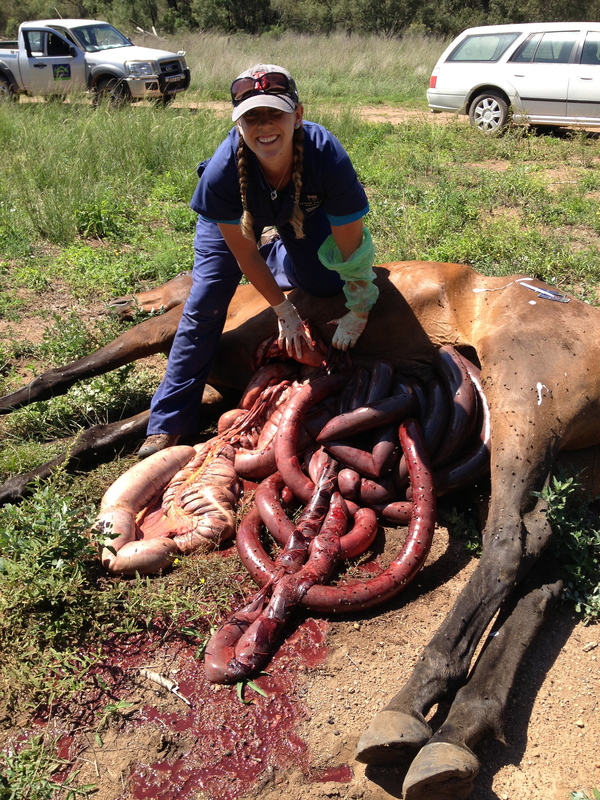 I am doing a post mortem examination on a mare that was found dead in a paddock. 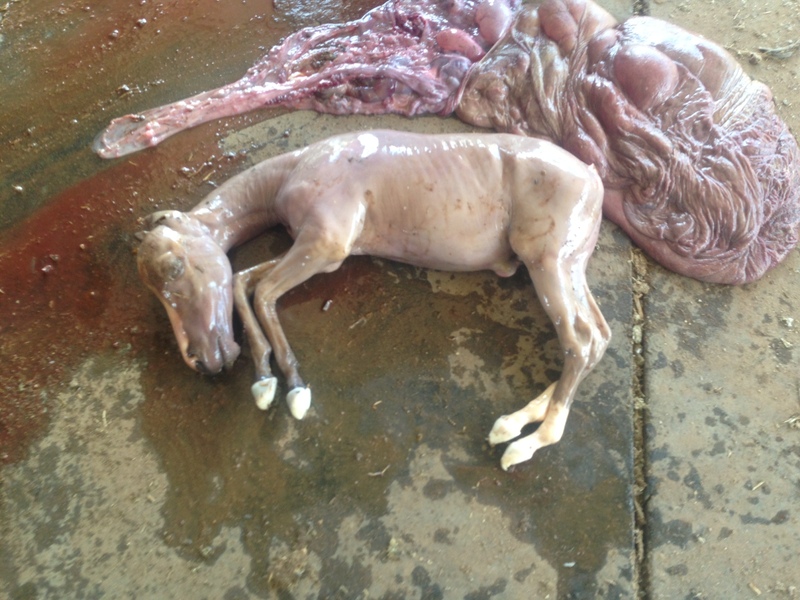 Her intestinal tract was very abnormal indicating that she died from colic. 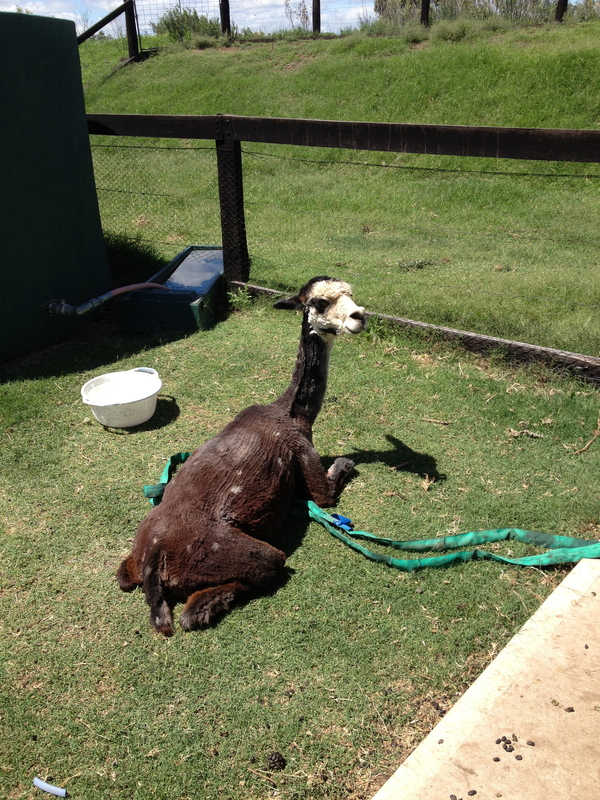 This little devil is one of my biggest fears…..meet Alpaca. 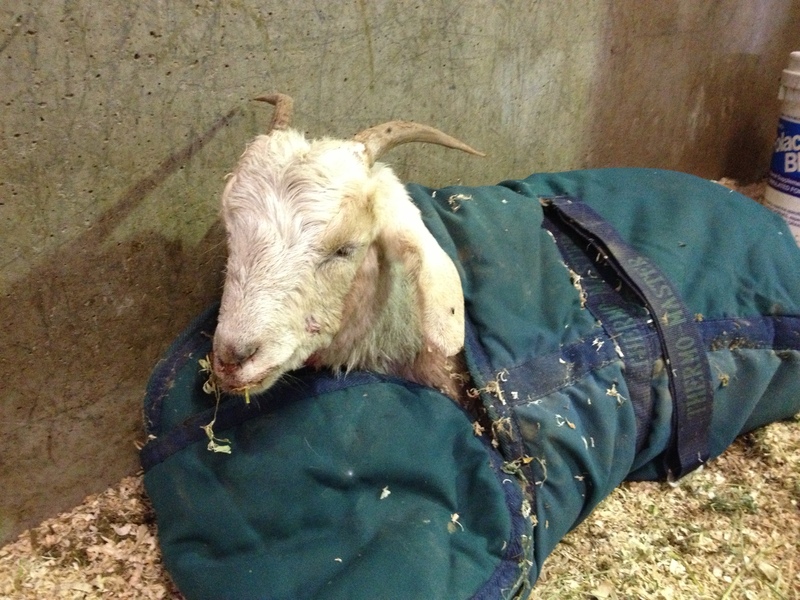 Unfortunately I had the lovely job of going out to see him as none of the other vets were around….ugh! Terrifying! 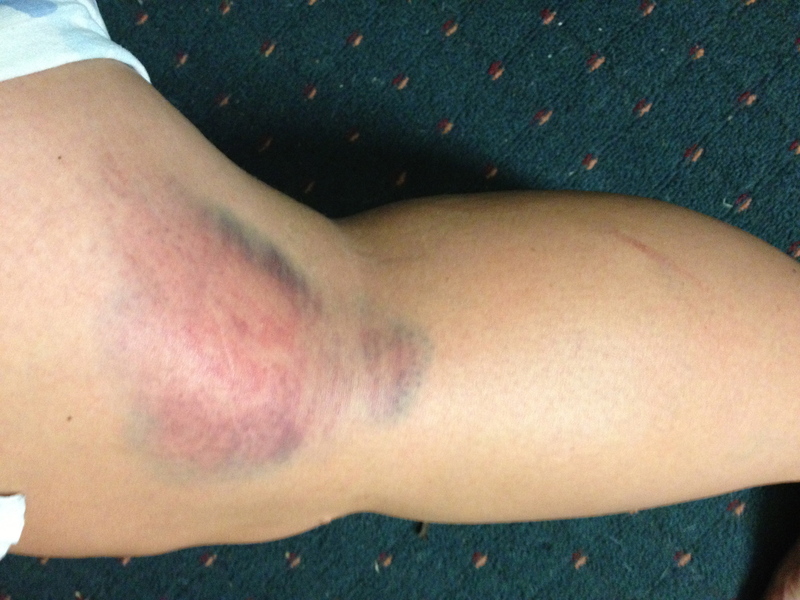 This is a very large haematoma (like a bruise) on the shoulder of a yearling. 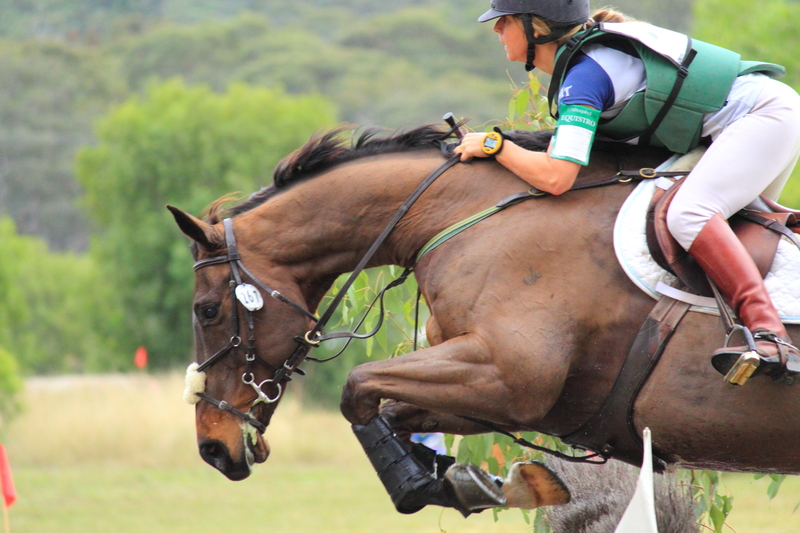 In case no one has told you….horses kick. This is my leg. 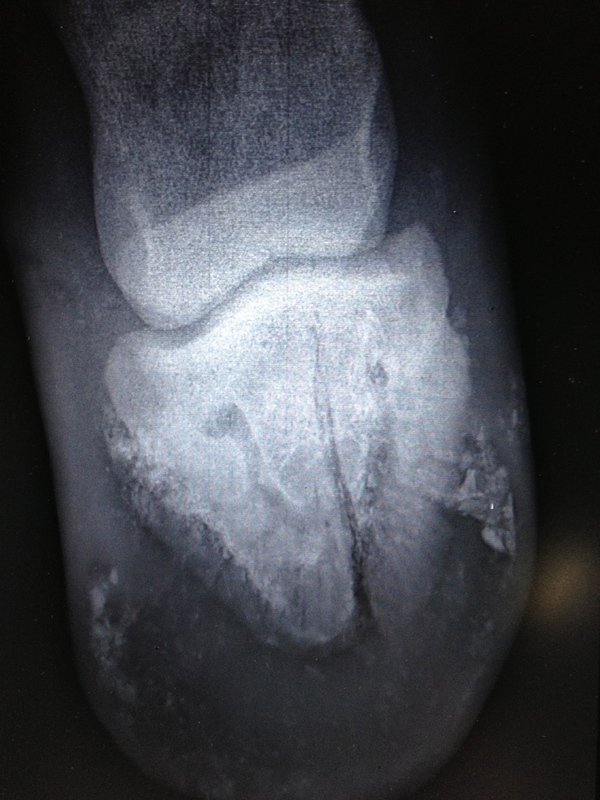 This x-ray of a foals foot shows a big pedal bone fracture (the big vertical black line in the middle). The pedal bone sits inside the hoof in a horse. 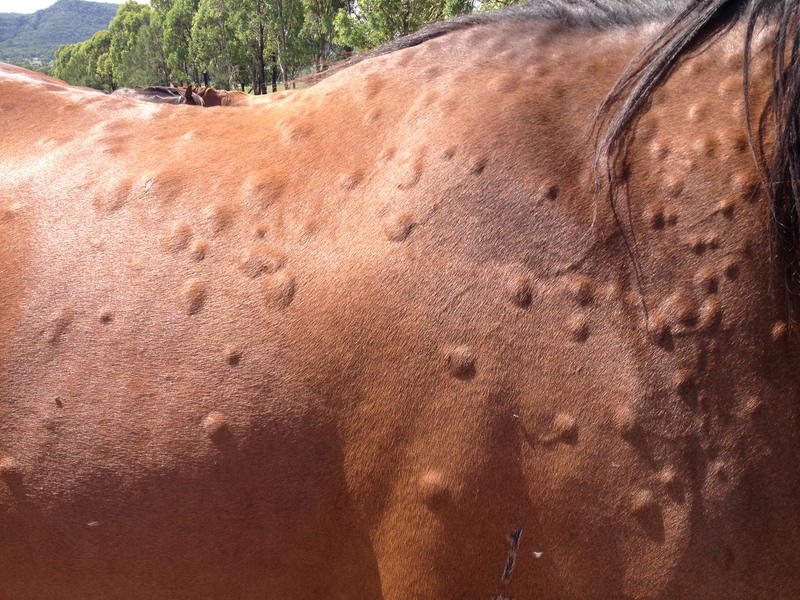 This poor mare had a bad reaction to insect bits and came up covered in lumps. Pretty spectacular! 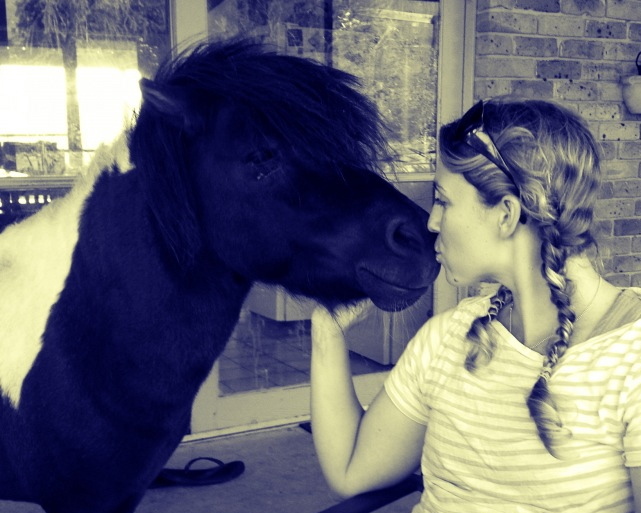 This is Merlin, he is a teaser stallion (a very tiny one). One of my neighbours had him as a lawn mower for a couple months and he made himself right at home, coming onto the porch and joining us for coffee. This is one of the more remarkable fractures I have seen. 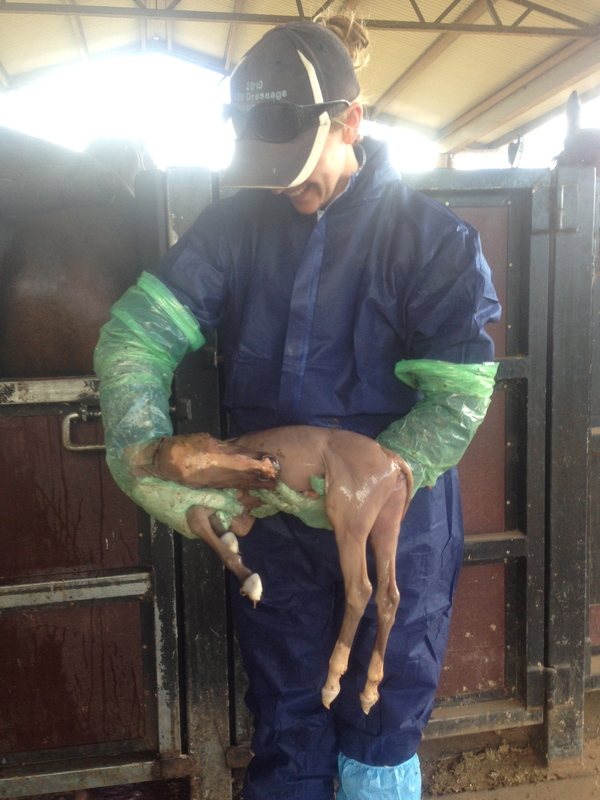 This is a weanling with a femoral fracture. 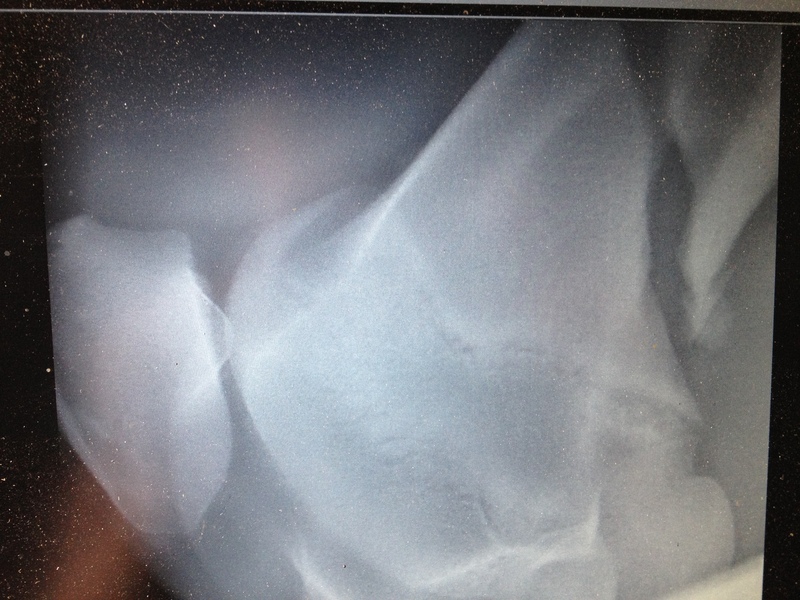 The round bone on the left is the patella (normal). Follow the large bone to the top right and boom! Huge black space = massive fracture. Unfortunately we had to say goodbye to her. 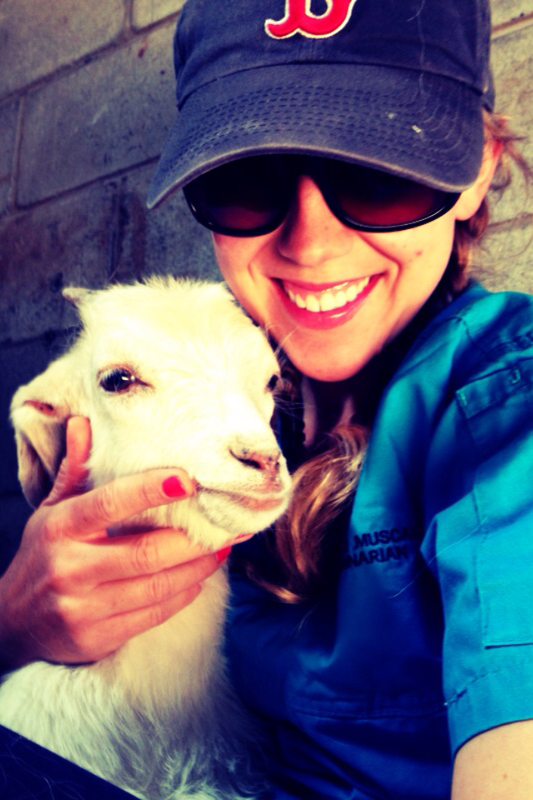 She was attacked by wild dogs in the paddock and hurt very badly. This is her bundled up after the attack. She died shortly after. Three beautiful baby kittens having a drink. 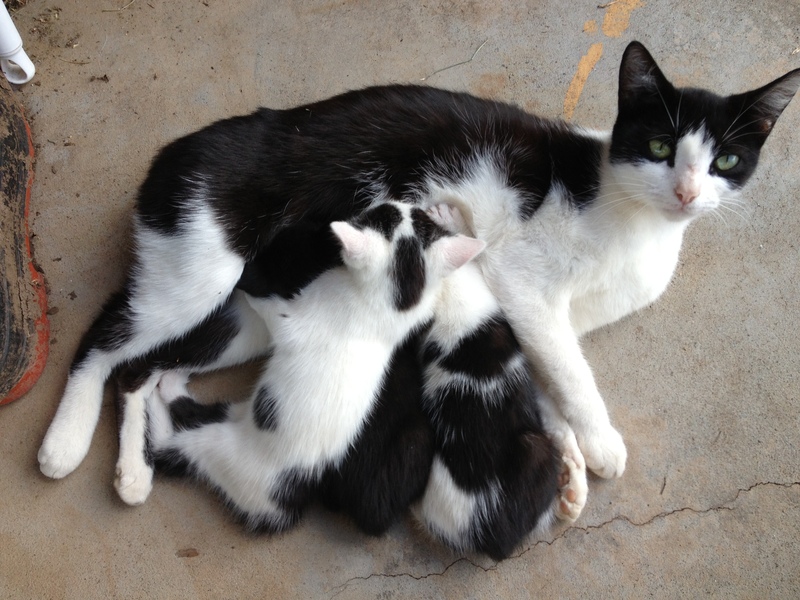 Just a perk of being around barns….lots of kittens to cuddle! 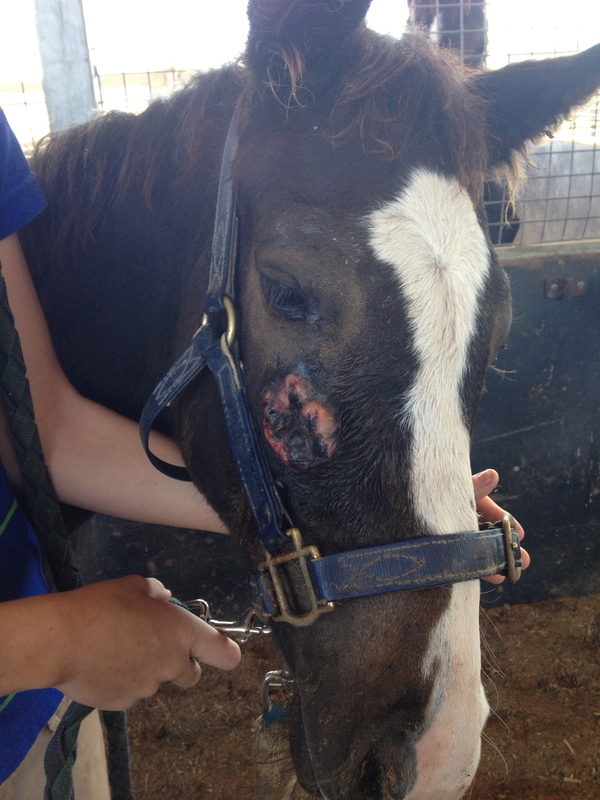 This weanling was kicked in the face and developed a horrible sore wound….poor baby. I had a bit of an unusual patient one early morning. 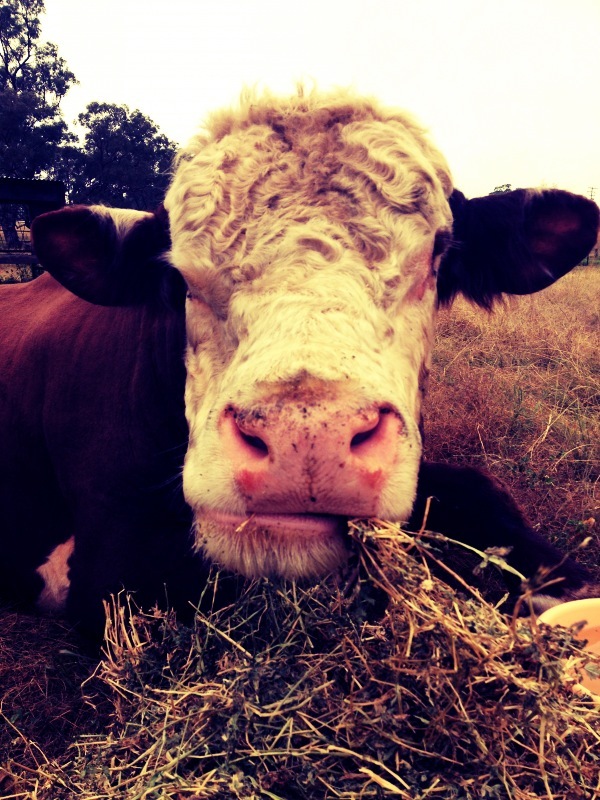 This is a huge bull who needed to have a blood sample taken. Haven’t done one since vet school but I managed and luckily he was a gentleman! 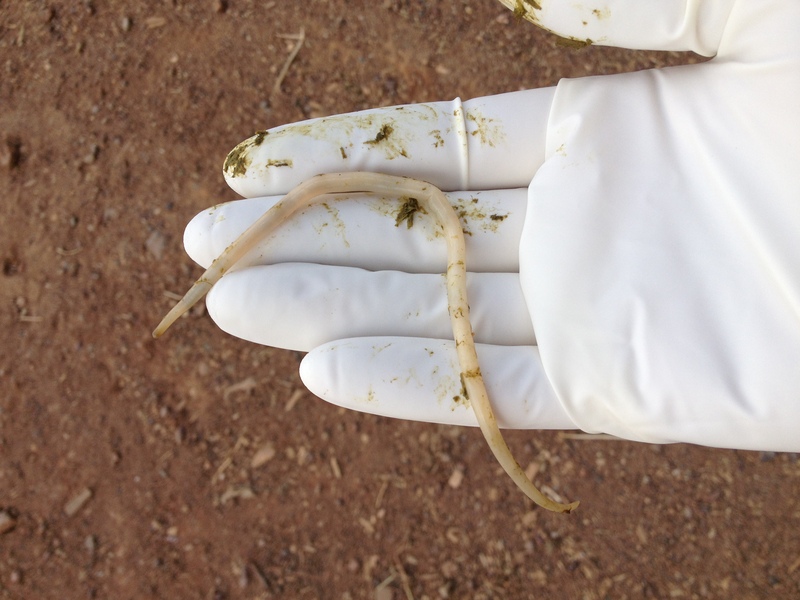 This gross worm was plucked out of some horse manure….ewwwwww! You rarely see them but they are pretty gross when you do! This is the aborted foetus and placenta. It always amazes me how well formed they are and so tiny.